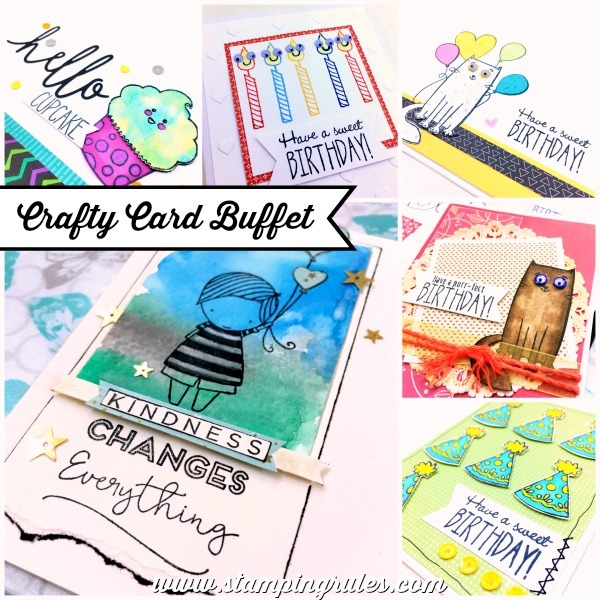 It's finally happening, my first ever Crafty Card Buffet! I'll be hosting a fun bunch of croppers on Sunday the 25th, and while the crop is now full, you can still drop by between 10 and 4 to get your card kits from this fun new card buffet. All cards are pre-cut and stamped, ready to assemble, with embellishments included, and just $2 per card! Stay to glue your cards together or take your kits to go. Just remember it's first come, first served, so arrive early for the best selection of card kits. Above is just a sampling of the available card designs. Hope to see you Sunday! I'm such a fan of your work Wendy. I'm not surprised your crop is sold out. They are lucky ladies to be able to make such cute cards! Have a fun day with them all! :) ...a fellow consultant! Aw thanks, Linda! I was surprised, lol - after not having done anything in person for so many years I didn't expect to fill my first crop. I'm so excited! Have a lovely day!